When A Church Pastor Gets Fired But Refuses To Leave…. In every organization or institution there are rules that must be followed. When those rules are broken, there are consequences – a disciplinary process is adhered to. Many have guidelines set out in such a way that when the rules are broken by an employee the first time, s/he get a verbal warning. The second time around you are given a written warning. The third time around, hey, you are likely to get fired right? That’s when employees break the rules. According to The Charlotte Observer, church members at a Charlotte, N.C., church are protesting a pastor’s leadership, saying he was fired months ago but won’t leave his post. The pastor, Andrew Rollinson (pictured above) of Morningstar Baptist Church in North Charlotte, says he has no intention of leaving because the process the five church leaders used to fire him did not follow the church bylaws. “I’m the pastor. I will be the pastor until people want to follow the bylaws,” Rollinson said. “This is a group of irate individuals who want what they want and are not able to get it according to the bylaws, and they become irate.” Although Rollinson did not say how members violated the bylaws, he said he has no intentions of leaving the church. Jackie Black, chairman of the church’s board of deacons, said the drama has distracted members from the church’s vision. He also said he will involve the church’s attorney in drafting the pastor’s contract in the future. “We’re going to make sure it’s very specific so nobody can take advantage of us again,” he said. 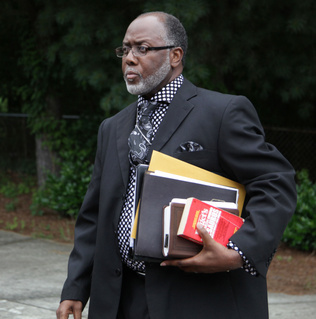 4 Comments on When A Church Pastor Gets Fired But Refuses To Leave…. I appreciate your openness to discuss this. Indeed it is really sad and I agree it causes division, and serious conflict. It even seems like we are made a “laughing stock” especially by non-Christians – we cannot draw them into the body of Christ/church if this is the kind of behavior being displayed by the people who call themselves Christians. This makes me so sad! I've been a part of a church where there were serious conflicts with membership and the spiritual head. It causes division and can drive people away from “organized” religion.